MANILA – Three Baguio-Benguet fighters got golds in the 1st World Youth Martial Arts Masterships in Jincheon, South Korea last November 2-7 to power the Philippines’ second place finish in the tournament. 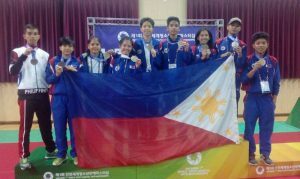 The Filipinos brought home six golds, one silver and two bronzes from the tournament participated by around 600 fighters from 30 different countries. The three local fighters taking home golds are Liane Benito, from Sablan, for girls 14-16, 48kgs; Mariah Trenyce Co, from Baguio, for girls14-16, 51kgs; and Islay Erika Bomogao, from Baguio, for girls 14-16, 45kgs. Rosemarie Recto and Felex Dave Cantores, both from Sablan, settled for the bronze medal in girls 16-18, 51kgs and boys 16-18, 60kgs to complete the haul for the locals. Photo contributed by Bryan Olod. The other fighters bagging golds were Rudzma Abubakar for girls16-18, 48kgs; Ghen-yan Berdon for boys 14-16 years old, 48kg and Bryan Ray Siglos for boys 16-18, 63.5kg. Kristian Narca won the silver medal in the boys 16-18, 48kgs to complete the Philippines’ haul. 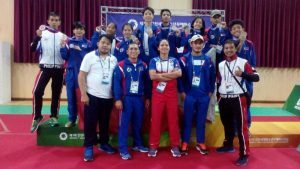 Coaches Precious Ocaya, Roland Claro and Jonathan Polosan accompanied the athletes while Edzel Ngina, Mardel Claro and Francis Amandy joined the trip as international technical officials. 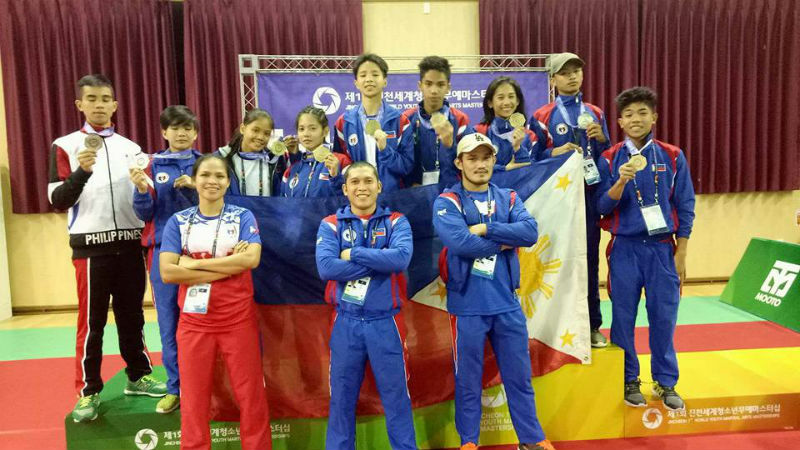 Muay Thai Association of the Philippines (MAP) secretary general Pearl Managuelod was ecstatic on the performance of the Filipinos expressed her optimism on the Philippines’ future in the sport. The fighters, however, got little time to rest as Sablan National High School and Kafagway MMA coach and trainor Bryan Olod confirmed that the MAP is now currently holding its national championships this November 8-14, 2017 at the Philsports Multi-Purpose Arena in Pasig City. ← Are You Feeling Low and Lost?